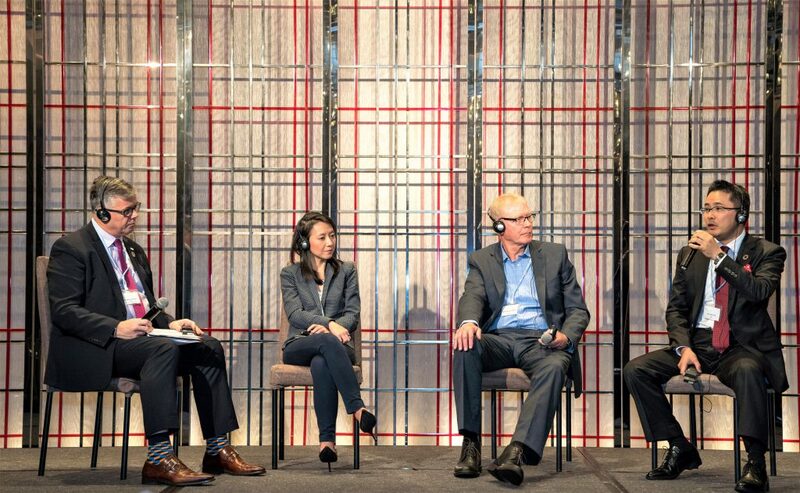 AOA held a biennial AOA Seminar in Hong Kong on 6 and 7 December 2018 as already briefly reported. 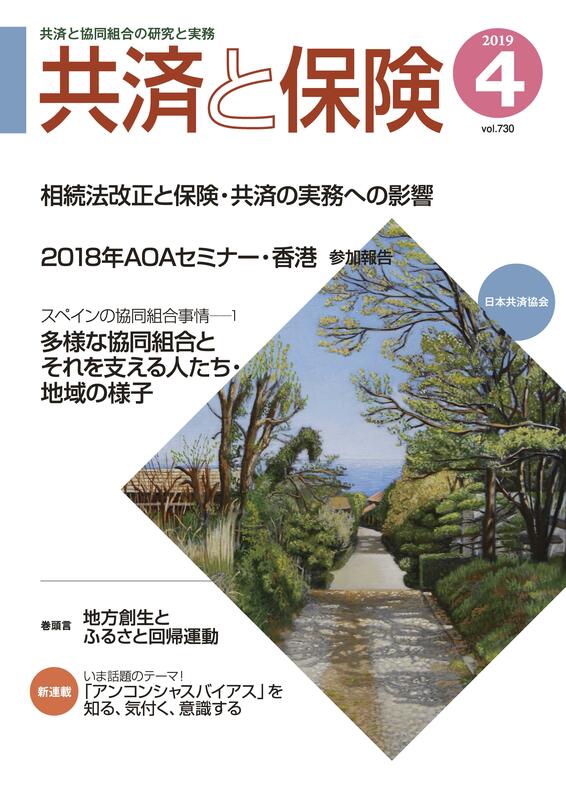 This is a reprint with permission of the report by participants of last year’s AOA Seminar that was published in the April 2019 issue of the monthly magazine “Cooperative and Commercial Insurance” issued by Japan Cooperative Insurance Association Inc. (JCIA), an ICMIF member. 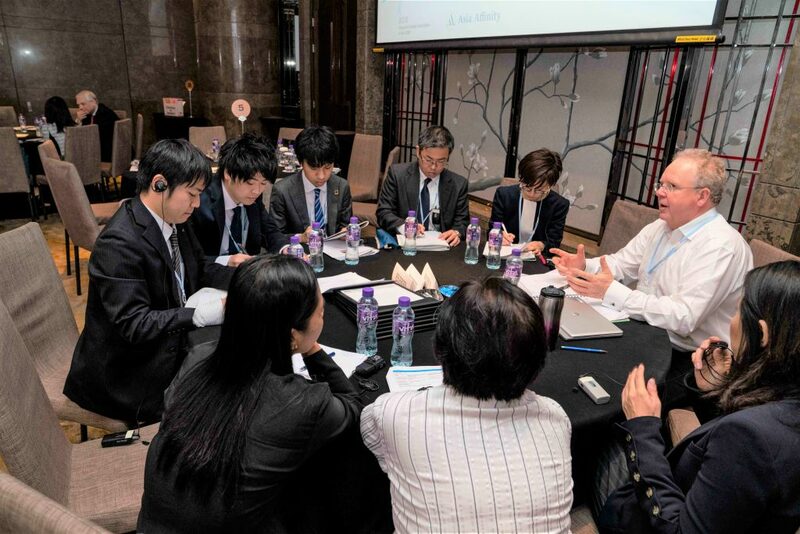 The Asia and Oceania Association (AOA) of the International Cooperative and Mutual Insurance Federation (ICMIF) held AOA Seminar in Hong Kong on 6 and 7 December 2018. 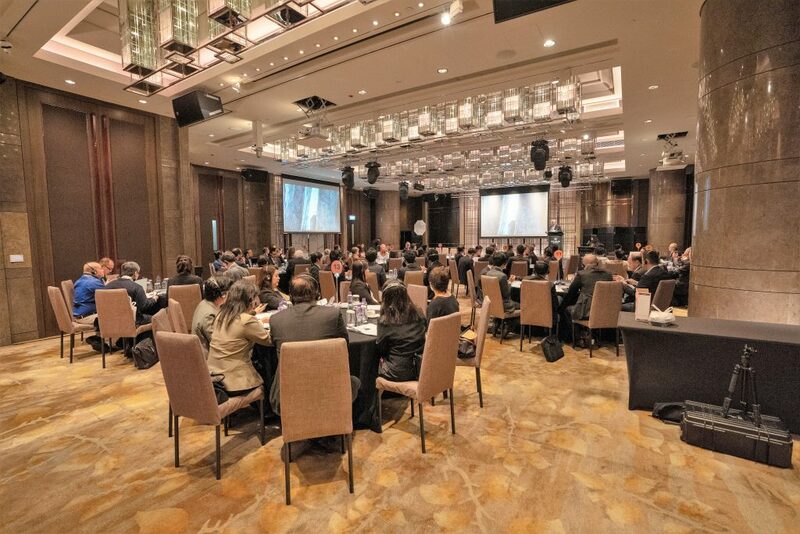 Under the theme of “Impact of Digital Innovation on the Strategies of Our Sector,” 83 people from 28 organizations representing 11 countries attended the seminar, which was hosted by Asia Affinity Holdings Limited, an associate member in Hong Kong. The participants were from various countries; Japan, China, South Korea, Hong Kong, the Philippines, Indonesia, and Singapore in the Asian region, Australia and New Zealand in the Oceania region, and the UK and France. Following the previous seminar in Tokyo that focused on utilization of digital technologies, the attendees were provided with opportunities to consider how we, cooperative and mutual insurance organizations, can incorporate the evolution of digital technologies into our business and utilize them, and what kind of points we should pay attention to in the process of utilizing them. These issues were examined from various perspectives through commentaries on the global digital trends in the keynote speeches given by experts, case reports of advanced initiatives by AOA member organizations, and panel sessions. The keynote speeches and special lectures were provided by significant influencers (those who have great influence on society) whom we invited from the “Asian Development Bank,” which is one of the Multilateral Development Banks, contributing to the economic growth of developing countries in the Asia-Pacific region, and “Willis Towers Watson,” a global advisory and insurance broking company. In his welcome remarks at the beginning of the seminar, AOA Chair Fumio Yanai (and President of the Board of Directors of Zenkyoren) said, “Digitization has been accelerating, and AI (Artificial Intelligence) and IoT (Internet of Things) have become common. If you consider user-friendliness as the top priority in this trend, it is essential to develop a business model utilizing these digital technologies. It has been said that companies incapable of properly responding to digitization will decline.” In addition to these remarks expressing a sense of crisis, he emphasized that it is necessary for cooperative and mutual insurance organizations to respond to the drastic changes in lifestyles along with the progress of technologies, saying, “We need to determine what innovation is appropriate and when it should be adopted, in order to achieve our sector’s sustainable development and provide our members and users with continuous support.” He continued, “What is great about ICMIF is its spirit of sharing knowledge, experience, and information with each other through the members’ network to achieve success in each market,” to encourage the participants to take this opportunity to have active and extensive interactions among them. In addition, as the first attempt, AOA offered “Young Leaders Program” (networking, free discussions with CEOs of AOA member organizations and ICMIF) for young professionals separately from the main seminar, aiming at promoting mutual exchange and enhancing motivation of “younger attendees,” which was another focus of the previous seminar in Tokyo. A total of 23 young employees representing 10 organizations in 4 countries participated in the program, and there were active exchanges between them. 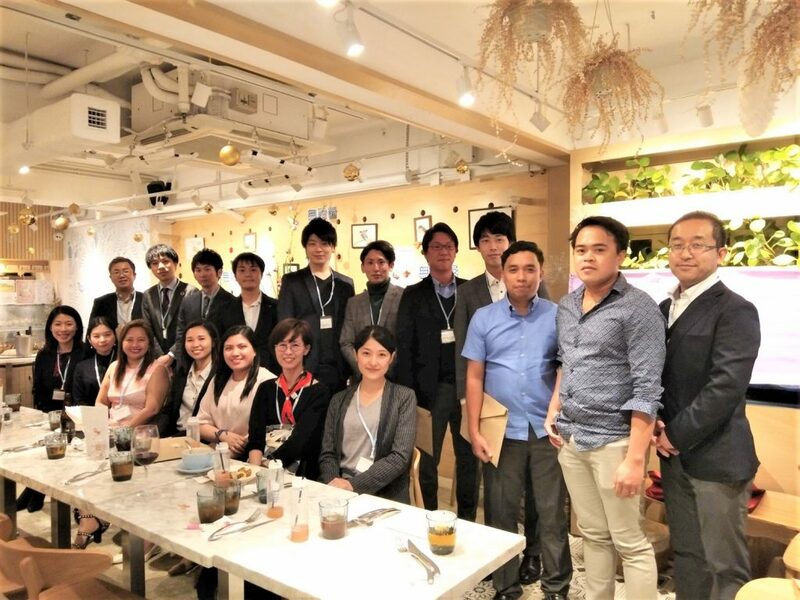 This article is a report by four people from ZENROSAI who participated in the seminar and the Young Leaders Program: Ms. Kyoko Hitoshio, Manager, Brand Strategy Department, Mr. Ryo Ishiwata, Manager, Claims Handling Department (Life Insurance), Ms. Rie Kiritani, Quality Control Department, and Mr. Yoshikazu Sato, Management Planning Department. The Asia and Oceania Association (AOA) is one of the regional associations of the International Cooperative and Mutual Insurance Federation (ICMIF). It has 46 member organizations from 13 countries in the region. The AOA seminar has been held once every two years for its member organizations, mainly providing commentaries on key issues and global trends concerning the cooperative/mutual insurance business and the insurance industry in general as well as cooperative organizations. In addition, activities of the member organizations are also reported. 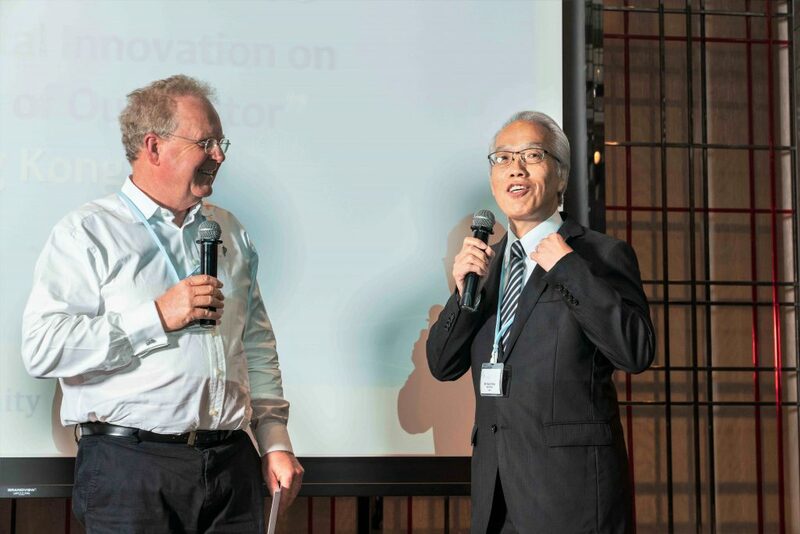 This report outlines the lectures and discussions at the AOA Seminar in Hong Kong (6 and 7 December 2018) under the theme of “Impact of Digital Innovation on the Strategies of Our Sector,” with 83 participants from 28 organizations representing 11 countries. Mr. Patrick Walker, Executive General Manager of Royal Automobile Club of Western Australia (Inc.) (Australia) shared their case study with the audience by saying, “Widespread use of safe driverless and electric vehicles can help reduce traffic accidents and solve social problems such as maintenance of transportation infrastructure and local communities in depopulated areas. To achieve them, we are promoting our project with the approval of local governments. We are continuing dialogues with a regulatory authority to have them understand the significance and future prospects of our initiative in order to conduct demonstration tests of the vehicles in public spaces. In addition, we have had our customers and employees understand how important our initiatives are socially, and this effort has led to enhanced brand strengths. This is the biggest factor of our 8% business growth per year.” His presentation made us recognize again that communicating the importance of our business to the society is indispensable for the growth of cooperatives. Among 25 insurance companies in Singapore, which is one of the most digitized countries, NTUC Income was ranked first in innovation, online, and overall by the Applied Innovation Institute Singapore Insurance Innovation and Digital Benchmark in 2018. Ms. Juliana Chua, Head of Digital Transformation of NTUC Income, who played the key role in the accomplishment, said “We place most importance on agility to avoid being left behind the trend of technological innovation. We have been promoting initiatives such as establishment of a dedicated team of digital innovation experts, designing of plans on a weekly basis, and establishment of business alliances with other organizations and start-ups.” In trying a new plan, she repeatedly said, “We do not seek perfection of the plan but place importance on how to quickly satisfy the needs of our cooperative members.” The entire audience showed great interest in their thorough efforts. Using the time before the start of lectures, young attendees were split into four groups and exchanged opinions with CEOs of overseas member organizations (Japanese attendees participated in the discussion in three groups). Mr. Graham Clark talked about the importance of redefining our business in line with the recent social trends, including SDGs (Sustainable Development Goals), and said that digital technologies are indispensable to gain support from members in our modern society. He added that he hopes for bold thinking and reform while maintaining the identity as a cooperative. Mr. Graham Clark gave a keynote speech on the theme of “importance of community for cooperatives.” Citing an example of microfinancing to the earthquake victims in Sulawesi Island in Indonesia, he proposed that we need to consider “what community we want to create and support,” beyond the framework of insurance business, in order to enhance values of cooperatives and expand their member base. He also explained five elements required to form and support a community (education, financial inclusion, ensuring profits, engagement, and effect measurement). Mr. Yoshinao Kiyama, Managing Director of Zenkyoren (National Mutual Insurance Federation of Agricultural Cooperatives) (Japan), who supervises the operational reform by digital innovation in Zenkyoren, presented utilization of smartphones to further improve customer services and reduce operational burden, as well as restructuring of the existing system that started in 2012. He also talked about research on how to use AI and blockchain while assessing the advantages and disadvantages of adopting them. 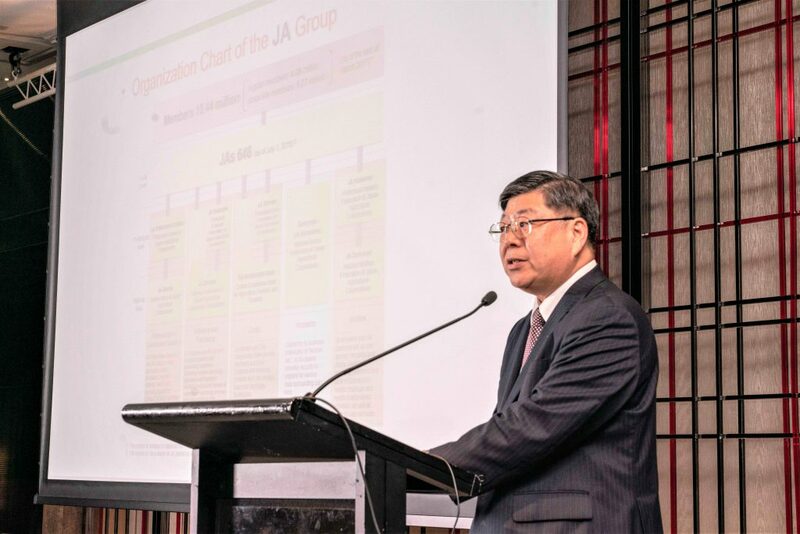 Furthermore, he presented a scheme aimed at establishing a JA (Japan Agricultural Cooperatives) economic zone by one-stop solution of various services (mutual insurance, finance, agriculture, agricultural and livestock products, medical care, food, environment, culture, and logistics) centering particularly on agricultural and livestock products and agriculture utilizing IT technologies, in order to further strengthen relations of trust with members. He added that partnership with other organizations is worth considering when promoting operational cost reduction and joint research of technologies. At present, there is a scheme to jointly promote research, development, and utilization of digital technologies among Zenkyoren, Kyoei Fire & Marine Insurance Co., Ltd., The Norinchukin Bank and other mutual insurers in Japan. He talked about a future perspective that they will be able to further enhance collaboration particularly with mutual insurers that share the spirit of mutual aid, as well as expectations for Japan Cooperative Insurance Association Incorporated to play a role as a bridge between mutual insurers. Mr. Jae-Bong Kim, Senior Manager, Digital Finance Department of NH Life Insurance (Republic of Korea) said, “In the Republic of Korea where financial transactions through mobile devices are becoming common, the insurance revenue of the new fiscal year on the online life insurance markets is growing at an annual average rate of 40%. Each company is further promoting system investments and establishment of a new department taking charge of FinTech (Finance and Technology). Aiming at becoming the top in the online insurance market, NH Life Insurance has established three major strategies; ‘development and promotion of products optimized for web transactions,’ ‘expansion of communication with customers via web and SNS,’ and ‘creating information-offering contents.’ We have been integrating online insurance, and various mobile services and websites into a comprehensive digital marketing platform, and strengthening promotion for young customers living in urban areas and their parents’ generations living in local areas.” The audience seemed very much attracted by the proactive adoption of technologies being promoted in NH Life Insurance, which used to be recognized as conservative. Mr. Glenn Croasdale, Head of Online Services of FMG (New Zealand) reported their initiative for achieving good balance between strengthening of online services and maintaining identity as a cooperative. Ms. Jackelyn P. Ballena, Vice President of 1CISP (Philippines) talked about her personal background of being promoted to an executive at a young age, experience she gained in attending the Young Leaders Program during the ICMIF Conference in London in 2017, and experience of a study group visit to Japan conducted by 1CISP in June 2018 utilizing her networking with young leaders in the conference, as well as young employee training plans within 1CISP. Dr. Manuel NGO, MD, Director of International Mobility and Operations Department of IMA (France) and Mr. Benoît RIGALLAUD, Head of Market of the same Department presented “eCall” service they offer currently in cooperation with the public sector in France. It has now become mandatory to equip all new vehicles with an “eCall” device. Their speech described their valuable experiences of a number of failures to achieve stable operation of the service, and discussions with the government to build consensus, as well as compliance with regulations. What impressed us most during the two-day seminar was that each member organization has been taking on new challenges in response to digital technologies that have begun to flourish. 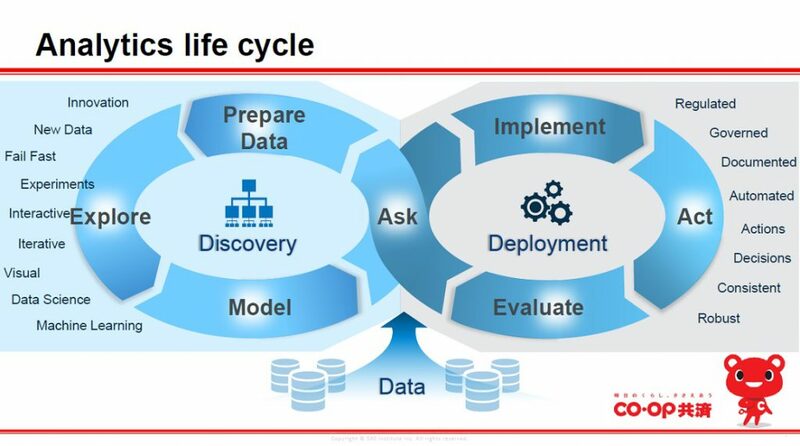 The word “agile” was heard in the speeches by multiple speakers, mainly in the context of system development. The cooperative and mutual insurance organizations, which are considered to be conservative in general, have been boldly repeating trial and error in their initiatives for adopting digital technologies in their systems, sometimes without fear that the results may not be sophisticated. This, we felt, represents their ever stronger sense of crisis of being left behind in the insurance market. We were encouraged by seeing that each member organization is struggling to tackle problems similar to ours and taking on challenges in various countries and in different regulatory environments, and that each of them is keeping its identity as a cooperative under this changing environment and technological trends. We are convinced that inspiration and confidence as a cooperative organization gained through this seminar will lead to new challenges to be taken on by each member organization. We would like to once again express our gratitude to the AOA Secretariat that offered this opportunity to member organizations and to speakers in the seminar. It is my honor to be asked to plan and organize the Young Leaders Program in Asia at the last Asia Oceania Association (AOA) Seminar 2018 held in Hong Kong along with Mr. Yoshikazu Sato of Zenrosai. I learned of the matter during the Young Leaders Forum and Intelligence Committee Meeting when I was in Finland through Ms. Hiroko Kowada, Executive Secretary of AOA. I was excited and looking forward on how we can pull off the program given it is just more than one month to prepare, it will be done outside the Philippines, and the participants are from different countries in Asia. It was quite challenging to conceptualize on how we will go about the Young Leaders Dinner given the various culture and language of the expected participants. For the AOA Seminar 2018, the Young Leaders activities included Young Leaders Dinner before the AOA Seminar 2018 proper and Meeting of Young Leaders with CEOs on the second day of the seminar. Further, part of the program is a sharing of a Young Leader’s Journey. There was a total of eighteen young leaders who attended the Young Leaders Dinner. The activity opened with a short introduction about Young Leaders Program. Followed by the Human Bingo Game to break the ice. Then dinner and networking wherein they had the opportunity to get to know more their fellow young leaders personally and professionally. Lastly, the night ended with writing of commitments in the Commitment Art Wall. For the meeting of young leaders with CEOs, Chris Black (Chief Executive of FMG), Graham Clark (Chief Executive of Asia Affinity Holdings Limited), Roy Miclat (President of 1CISP), and Shaun Tarbuck (Chief Executive of ICMIF) gladly answered the queries of present curious young leaders. Young Leaders were given the opportunity to ask anything under the sun. Yours truly delivered my Young Leader’s Journey experience since 2017 ICMIF Biennial Conference in London and my takeaways in attending the Intelligence Committee meeting with Young Leaders Forum members in Finland last November 2018 with the audience. I ended my presentation with a challenge to both segments of the group. Asked present Presidents/CEOs/Board of Directors if they are ready to trust their young leaders. On the other hand, asked present young leaders if they are ready to face the challenge. With said presentation, I am hopeful that leaders in position would trust more their young leaders and give them a break to prove themselves and make a difference in their organization. On the other end, inspire more young leaders to accept the challenge. With this first ever Young Leaders Program in Asia during the AOA Seminar 2018, I am hopeful that this is just the beginning.